One way that Donald Trump launched onto the political stage five years ago was through his fervent claims that President Barack Obama was not a U.S. citizen. Though Obama has since produced birth certificates certifying his birth in Hawaii, recently, such rumors have been given new life by commentators and pundits on the right. But just how many continue to think the president was not born in the U.S.? And which voters hold such views? Seventy-two percent of registered Republican voters still doubt President Obama’s citizenship, according to a recent NBC News|SurveyMonkey poll conducted in late June and early July of more than 1,700 registered voters. And this skepticism even exists among Republicans high in political knowledge. 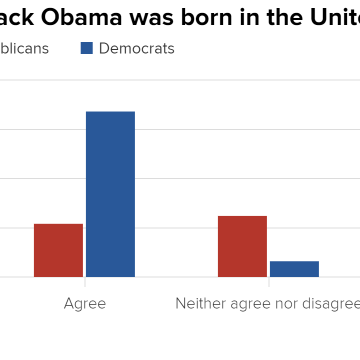 To see whether voters believe that Obama was not born in the United States, we asked them about their agreement with this statement: “Barack Obama was born in the United States.” The chart below shows responses broken down by party identification. 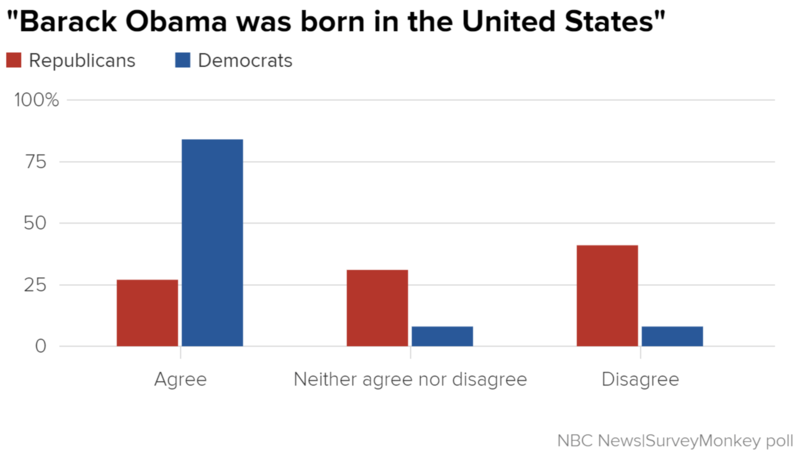 A first look reveals significant and surprising differences between Democrats and Republicans when it comes to their beliefs about Obama’s birthplace. While more than eight in 10 Democrats agreed with the claim, far more Republicans disagreed with the statement (41 percent) than agreed with it (27 percent). An additional 31 percent of Republicans expressed some doubts about whether Obama is a native U.S. citizen (i.e. indicating that they neither agreed nor disagreed with the statement). Only slightly more than one in four Republican voters agreed that the president was born in the United States. But do these beliefs hold true for all types of Republicans? Is skepticism about the president’s place of birth a consequence of a lack of interest in politics, or is this skepticism prevalent even among the most knowledgeable Republicans? To probe this possibility, we asked respondents three factual questions about politics* and we compared the beliefs of those correctly answering at least two of the three questions to those who did not. 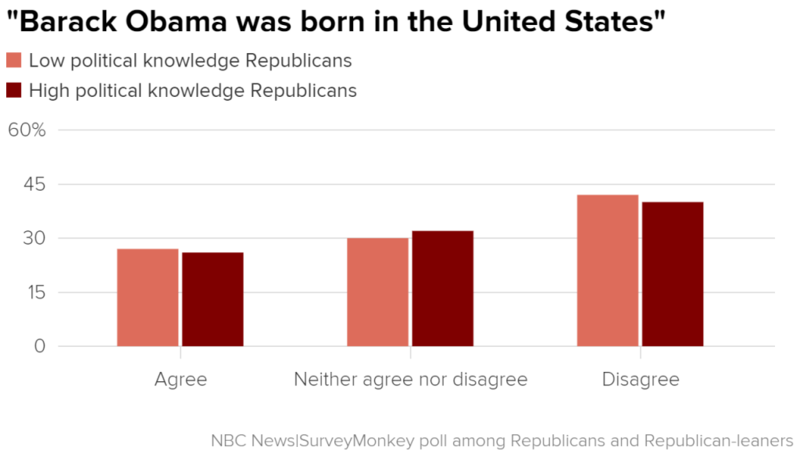 The chart below shows that there are virtually no differences between low-knowledge and high-knowledge Republicans when it comes to their beliefs about Obama’s citizenship. 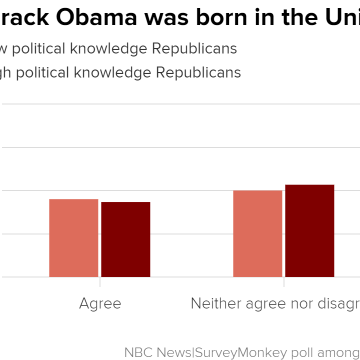 In fact, the distributions are statistically indistinguishable: 40 percent of knowledgeable Republicans disagree that Obama was born in the U.S. compared to 42 percent of lower knowledge Republicans. A greater factual understanding of the political system does not diminish Republicans’ doubts about Obama’s birthplace. The fact that more Republicans currently think that the president was not born in the U.S. and that this belief does not depend on how knowledgeable they are about politics is surprising. The country may be divided about both facts and opinions. Moreover, given the persistence of these beliefs in the face of evidence to the contrary, not only are we likely to see more rumors emerge, but their effects may be long-lasting. The fact that so many Republicans believe that the president was not born in the United States despite evidence to the contrary suggests that in the partisan-charged environment, it may be very difficult to dispel rumors and outlandish claims regardless of wins on Election Day. The NBC News|SurveyMonkey poll was conducted from June 27 through July 5, 2016 online among a national sample of 2,201 adults aged 18 and over (+/-2.5), 645 registered Republicans including leaners (+/-4.4), and 840 registered Democrats including leaners (+/- 3.9). Respondents for this non-probability survey were selected from the nearly three million people who take surveys on the SurveyMonkey platform each day.